★This item is a perfect place for reading lamp and other decorations, it can store your books, phone, keys or other tiny things, make your room tidy and clear. Stylish design and fine texture surface make this item blends well with any other home furniture, ideal for bedrooms with multiple storage purposes. Natural wood material is no harm for people's body in the room. ✔Durable and well made, this nightstand made of high grade moisture-resistant and durable wood material, healthy and environmental friendly. ✔The compact size meets your daily needs, this stylish storage unit is ideal for bedroom, living room or other suitable place. ✔The table has a convenient drawer and a smooth shelf that provide spacious storage for cups, flowers, tissues and other decorative items. Sturdy & Durable - Made of high quality wood material and surface paint, makes this table durable and long lasting. Classic Style - Natural wooden style can be matched with any style of furnitures. This stylish storage unit is ideal for bedroom, living room or other suitable place. Spacious Storage - Bottom shelf and drawer helps you to organize books, lamp, cellphone, speaker. Also with the suitable size this table is very space-saving. Multi-pose Small Table - Stylish design table can be used as bedside table, nightstand, coffee table and snack table. Great for living room, bedroom, office, and everywhere you want. 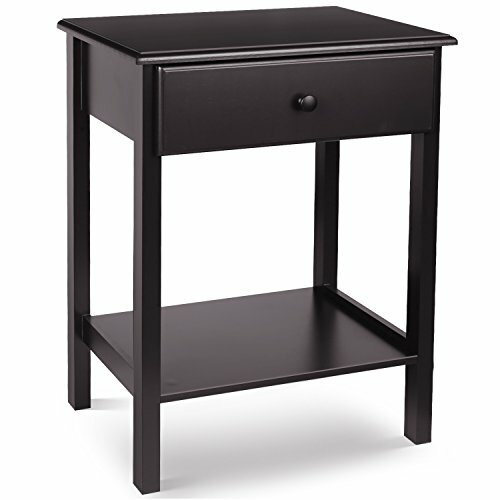 Compact small nightstand in kids room. Easy to Assemble & Clean - Comes with simple instructions, all required accessories are included in the package. And with surface paint finish, the table is easy to clean.